MIOG is a team of practitioners working collaboratively rather than as isolated independent practitioners. This facilitates a cohesive and integrated planning process that is unique in oncology healthcare. All MIOG practitioners meet weekly to discuss patient progress and outcomes in order to provide optimal ongoing treatment support. Tanya Wells has travelled internationally many times in order to visit Integrative Oncology clinics and hospitals to determine the most appropriate organisational structure for sustainable and effective patient care. The most sustainable care protocols occur when all practitioners work as a cohesive, multi-disciplinary team to discuss and contribute to the care of patients enrolled in treatment. The MIOG clinic itself provides a visually pleasing blend of clinical practice and comfort, with a spacious chill-out zone, informal areas and a relaxing ambiance. Juices, snacks and teas are all provided for MIOG patients and their carers. The clinic provides full disabled access and facilities. A range of courses and group activities are also offered, including meditation/mindfulness, yoga, and monthly 'food as medicine' cooking workshops. Tanya Wells, MIOG Founder and Lead Clinician, and her team have been working with patients with cancer for years, and they understand the challenges patients face on a physical, emotional and psychological level. MIOG is a highly respected evidence-based clinic for people who want to combine standard oncology treatments with evidence-based integrative approaches. As a qualified Naturopath, Tanya has been practicing for over 20 years. Tanya's special interest and expertise is in the research and development of Integrative Oncology Programs: utilising the best Evidence Based Complementary Therapies to work in conjunction with conventional treatments such as surgery, chemotherapy and radiotherapy. She has visited and worked in Integrative Oncology Hospitals in Europe and Asia where she collaborated with clinicians at multiple Integrative Oncology Hospitals. In 2018 she visited Integrative Oncology Clinics in China, Thailand and Japan, and will travel to the USA in October 2019. 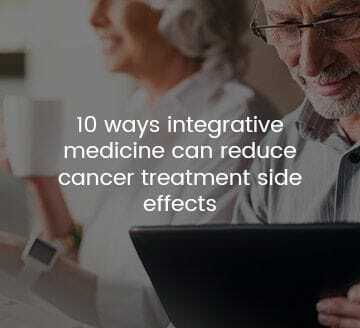 These international clinic experiences allow Tanya to share information with other practitioners so that the MIOG Integrative Oncology programs are continually developing. Tanya is an experienced lecturer at tertiary level, primarily focussing on Clinical Supervision/Assessment and her specialist subject 'Integrative Pharmacology'. She also lectures Naturopathy students in Herbal Medicine and Nutrition. As a tutor for the Faculty of Medicine at Monash University, Tanya has taught first and third year medical students in areas of Health Enhancement (specifically meditation, nutrition, stress management and exercise) and Community Health Promotion. Tanya has written and presented a range of 'Drug-Herb/Nutrient Interactions' seminars for Medical, Pharmacy and Nursing Professionals in Integrative Medicine. She is a contributing author to a range of clinical textbooks. As a highly accomplished senior scientist and immunologist, Shala finished her PhD in immunology and melanoma cancer research in 2002 at Monash University. For her postdoctoral fellowship Shala was offered a position at Shriners Hospital for Children (Portland, Oregon, USA). As an author, Shala has published scientific articles in a number of nationally and internationally recognised journals. After 10 years of postdoctoral fellowship in cancer research and immunology, Shala sought to start her second Bachelor Degree in Health Science (Naturopathy) at Endeavour College of Natural Health in 2012. Shala is the Lead Researcher at MIOG and balances clinical practice with consistent development of our extensive database of evidence based research. She is dedicated to the comprehensive analysis of supportive interactions and research for cancer patients. As a clinician, Shala's passion is in integrative and herbal medicine, nutrition and cancer support. Shala is also interested in other health conditions such as endocrine issues, digestive and cardiovascular health. Jane is a health psychologist with over 15 years experience working with individuals with cancer. Jane continues to offer evidence based intervention to individuals, couples and families at all stages of the cancer experience from diagnosis to bereavement. She has extensive experience using cognitive-behavioural therapy, acceptance and commitment therapy, a range of existential approaches and mindfulness based interventions. She is qualified in medical hypnosis and uses this for the treatment of cancer related sleep disorders, and phobic and conditioned responses. She has a special interest in sexuality and is experienced in a range of specific interventions for the psycho-sexual issues associated with a cancer diagnosis. Special interests include breast, gynaecological, prostate, bowel, lung and haematological cancers. Jane is passionate about offering care to those diagnosed with less common cancers. She also works with those who have tested gene positive for cancer and who may require prophylactic surgical intervention. Jane speaks widely, both locally and internationally, to peers and those living with a cancer diagnosis, and she holds adjunct appointments with Monash University and the Szalmuk Family Psycho-oncology Unit. Liz has worked in the field of health and wellbeing in NZ since the 1980's firstly as an Occupational Therapist in Psychiatry, then private counselling practice as a Clinical Hypnotherapist and Master Practitioner of NLP. Liz trained with the Gawler Foundation as a Cancer Group leader and moved to Melbourne in 2010 to take up a therapist position. As a therapist, she has specialised for many years in the holistic treatment of depression, insomnia, anxiety, sleep and trauma recovery. Currently Liz is engaged in cancer and illness counselling, and has a particular interest in assisting clients to create meaning and purpose in their lives. Many of her counselling sessions involve gentle guided processes to heal past traumatic life events, enabling clients to engage with life more fully in the present and focus on recovery. As a meditation teacher, Liz leads both group & individual Mindfulness Meditation sessions and relaxation processes - Meditation being a powerful emotional tool when dealing with a cancer diagnosis and treatment. Tanya appears to understand my illness very well, she is very easy to communicate with and knowledgeable in the field of oncology.